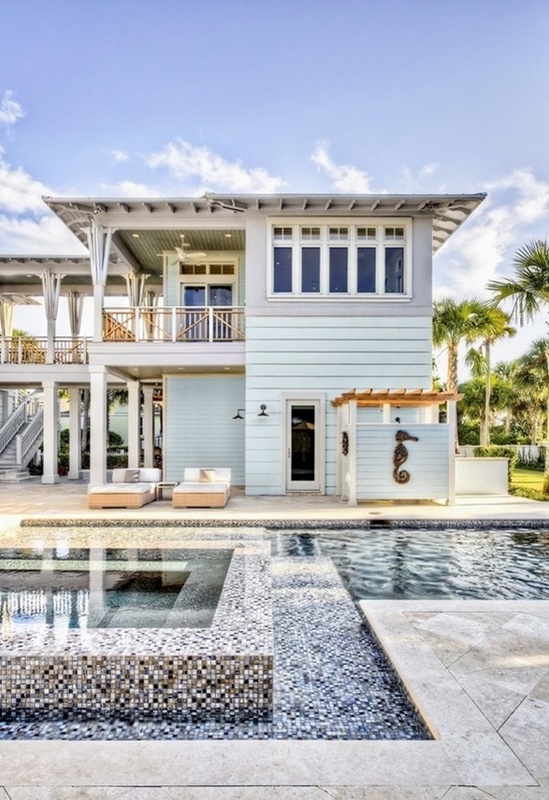 This is a dream home on Harbour Island and can I tell you it is....well I find it an amazing WOW! 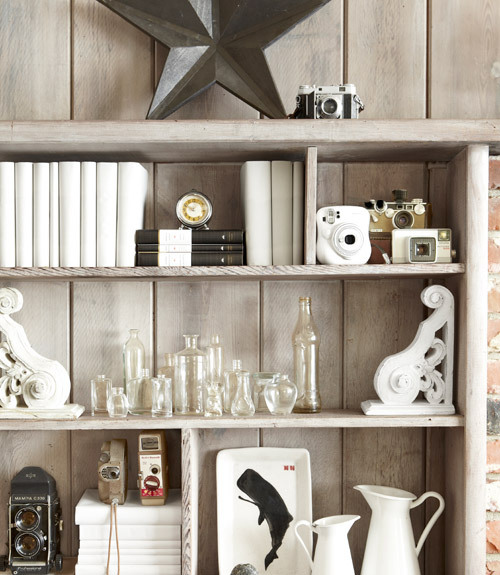 It feels delicate, beachy, refined, colourful and all white at the same time. 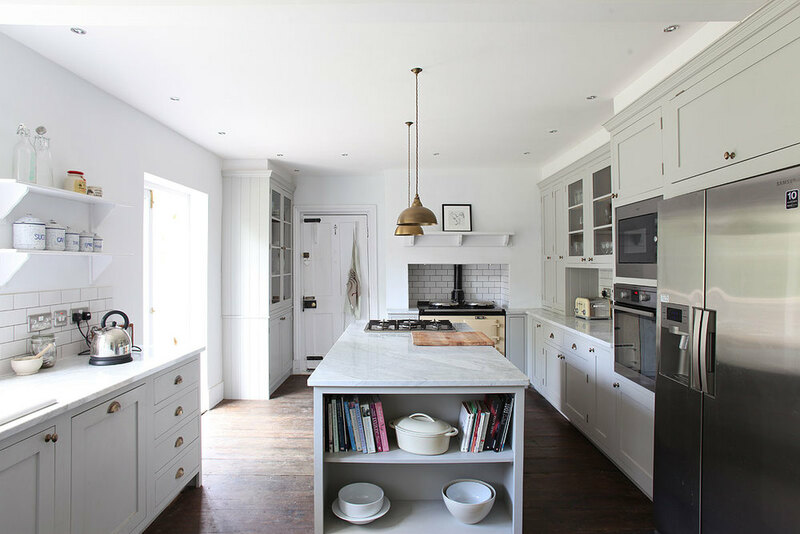 The walls and ceiling are so perfect with the white washed wood and the great marble floor. 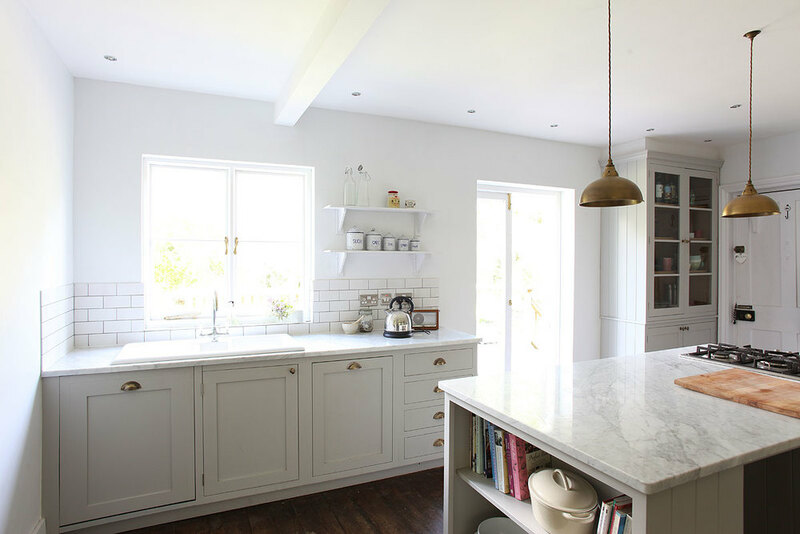 The touches of coral throughout the home is so beautiful and what about the kitchen. 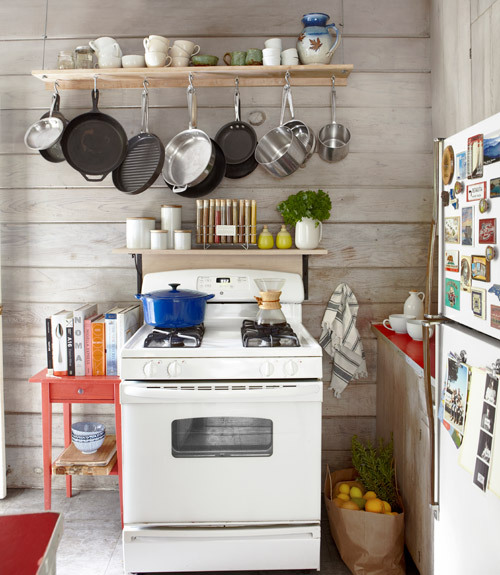 Such a good idea to add that gold and white wallpaper. Really just perfect!! 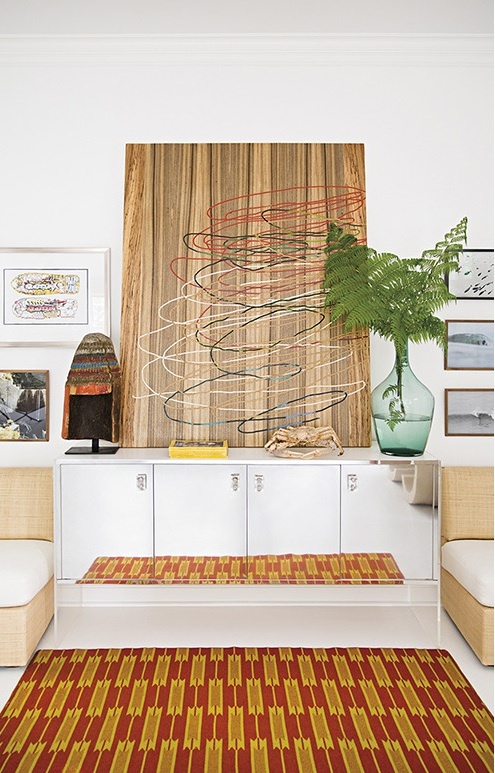 via: Lonny - go see the rest of this editorial. Amazing!! 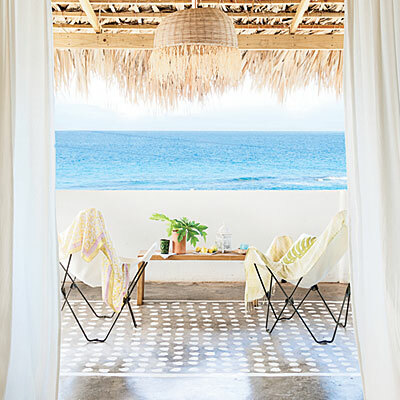 Love this home from Lonny Magazine that is pretty much a beach house dream. 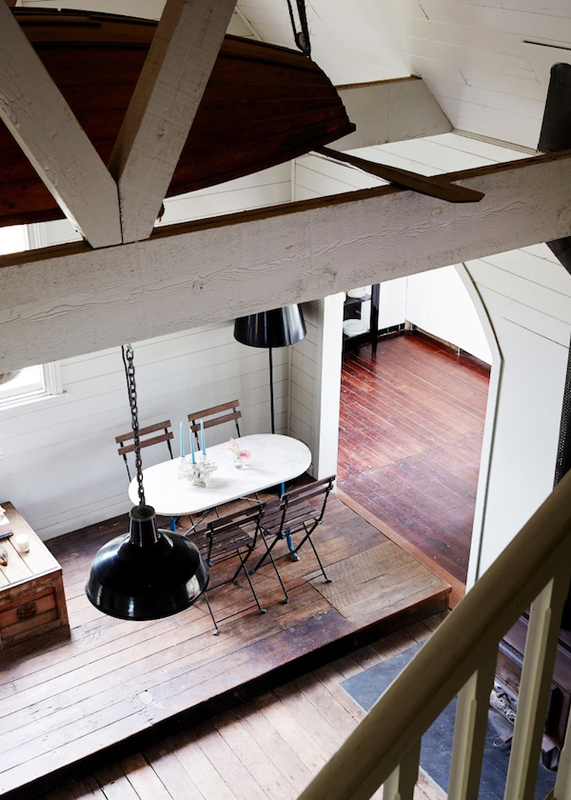 All light and airy with plenty of white up to the beams and down to the floor. 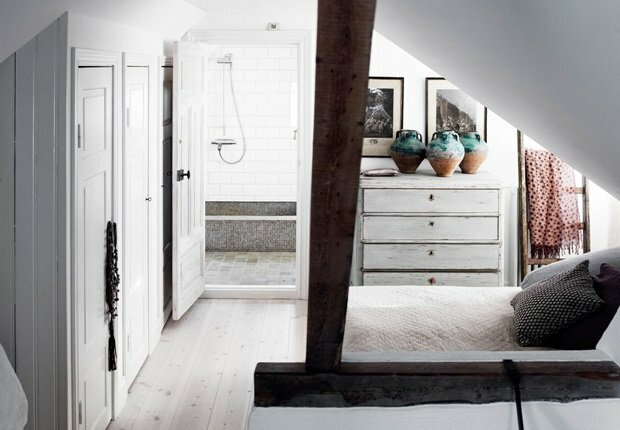 Rustic touches with a little nautical add the cottage feel to this Sag Harbour hideaway. The back of the house with the pool really does it for me...great spot to spend a weekend. 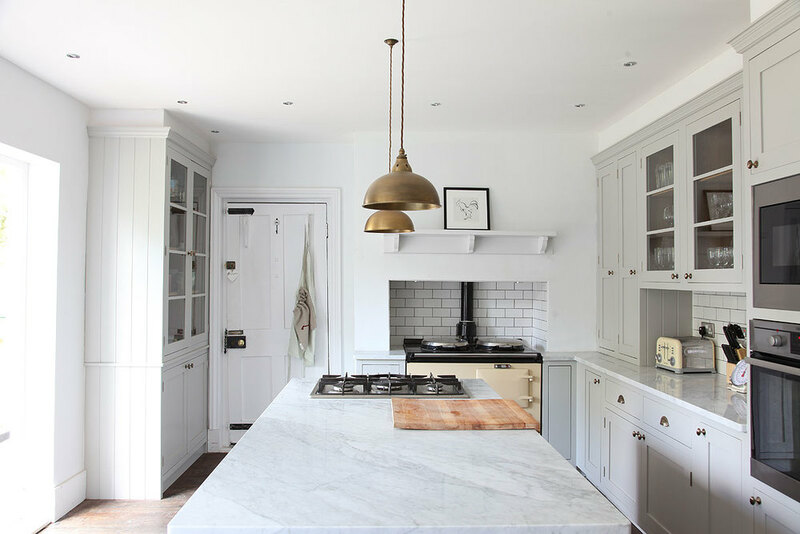 This wonderful 90 year old home needed a major renovation that no one wanted to tackle. 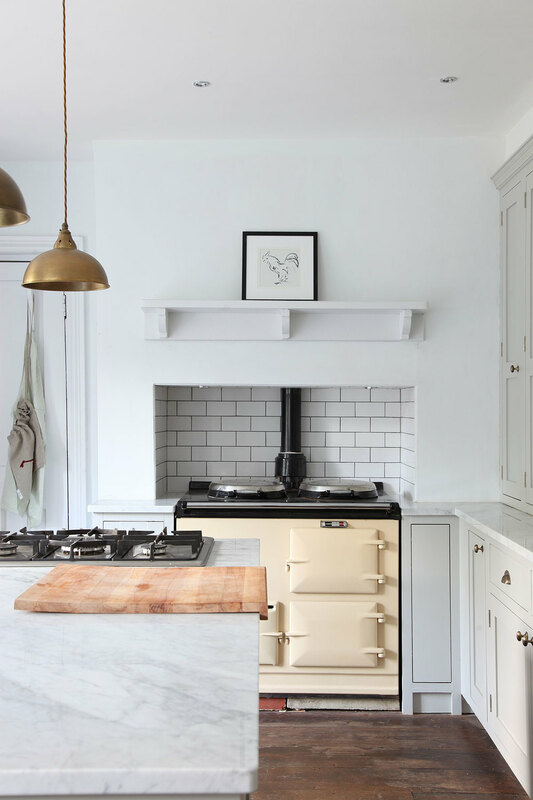 Eventually bought by a young family with many craftsmen in the family to help them along the way. 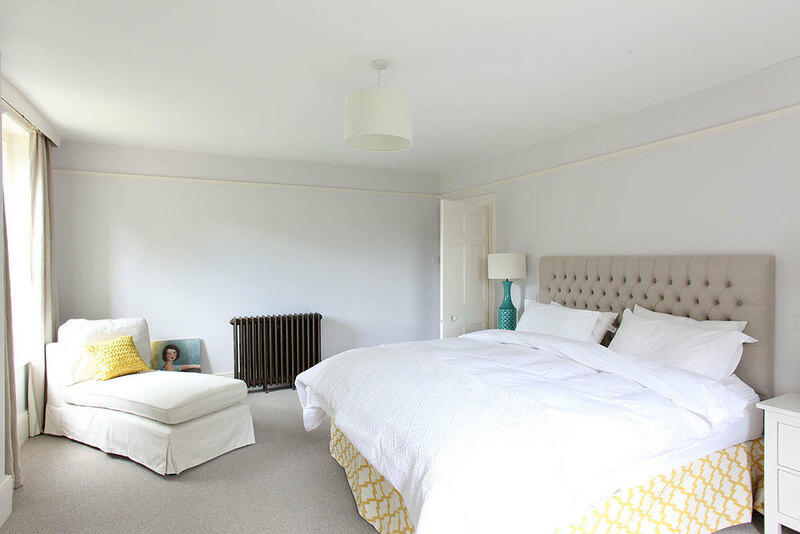 They did a lovely job keeping some of the original features and changing when necessary. 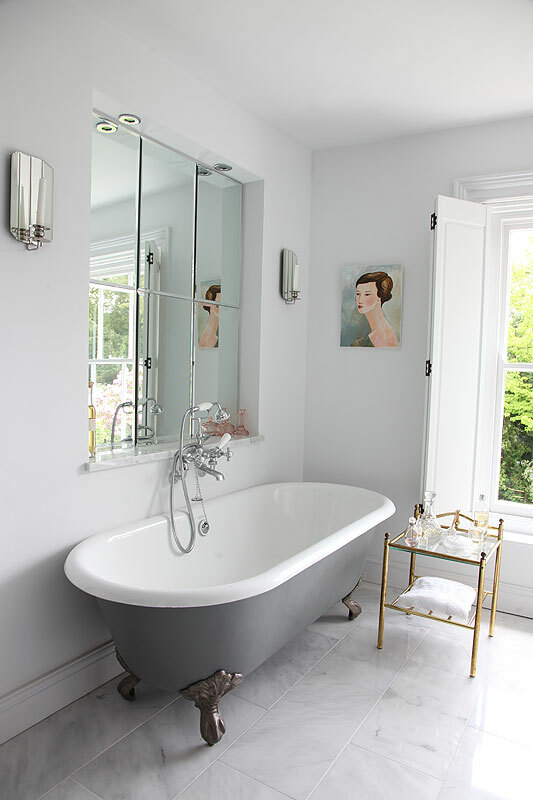 The hallway tile that was moved from another room in the house is from the 20's and vintage lamps, mirrors and furniture are found throughout the space. 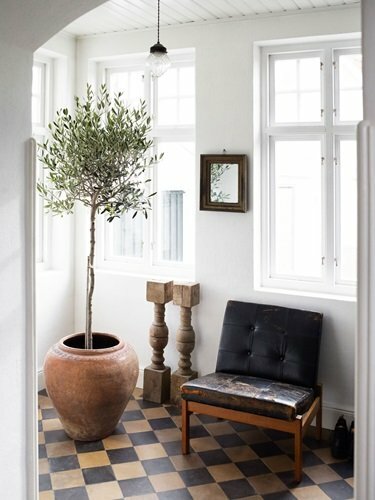 Love the olive tree in the hallway! 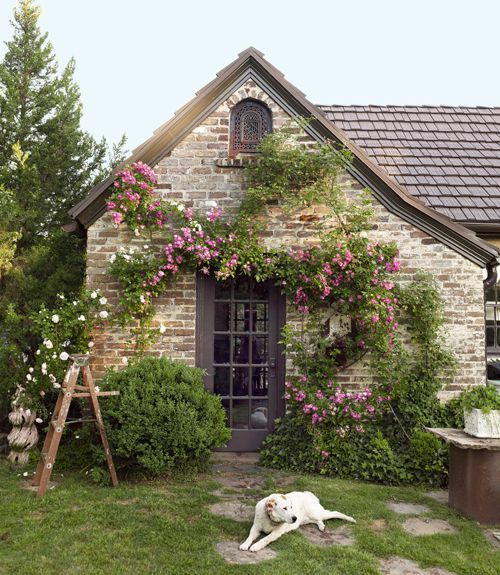 These cottages are so cute and cozy...some with shutters, others with ivy weaving around the windows and pretty roses. 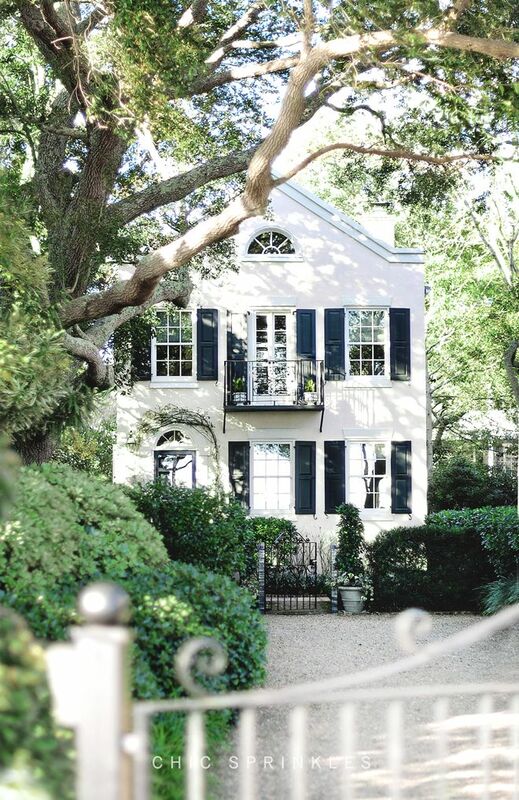 I really love the white cottage with black shutters in the first picture. 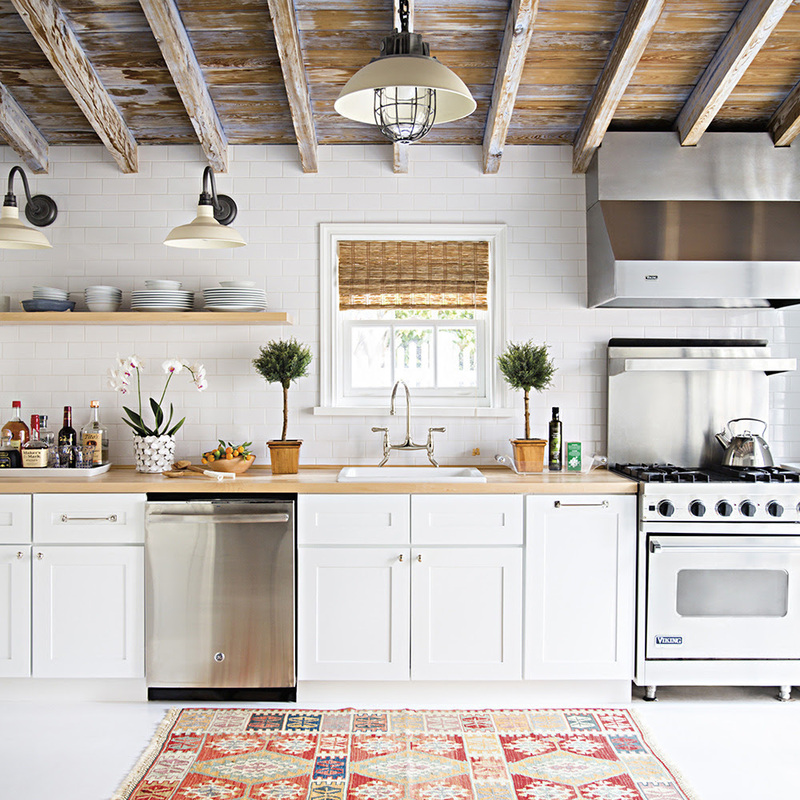 To me this is the ideal look for a cottage...a classic look for sure. 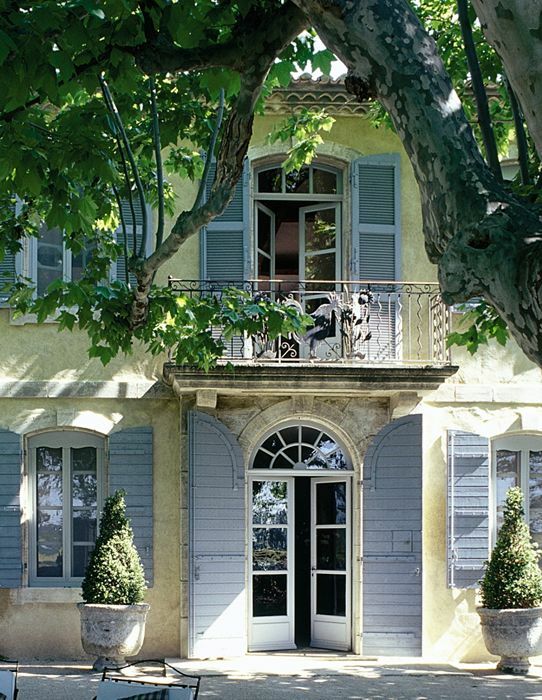 Add a wrought iron fence around the property and you have one perfect setting. 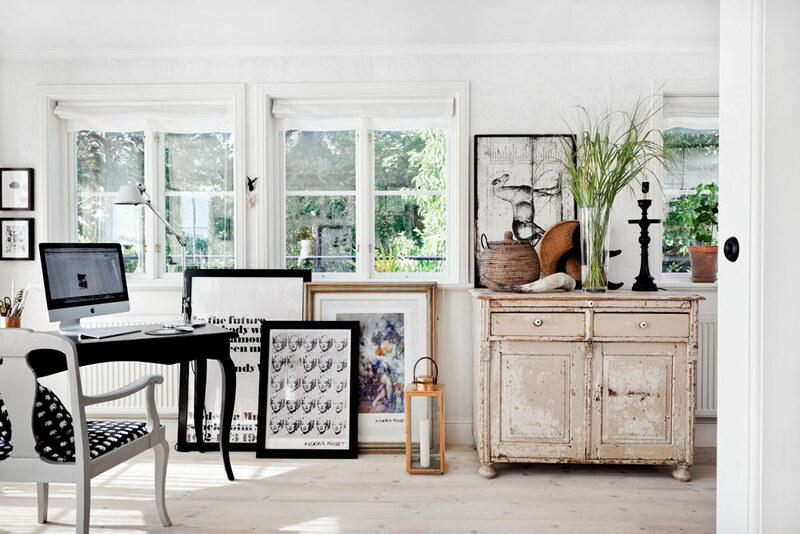 Wonderful Swedish country home of the Skonahem blogger Asa Myrberg. You can see her blog here...She has wonderful taste and is very creative in her style. 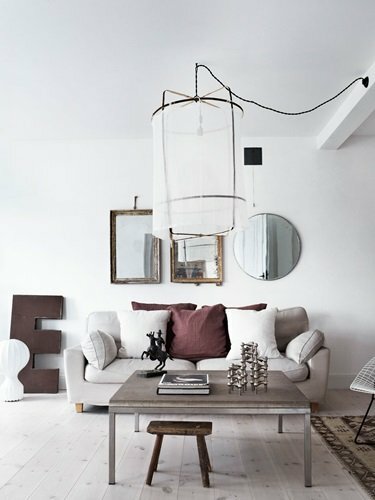 Mixing vintage with modern, high end and low makes for a fun and relaxing space. So much to love!! First I would say you need the best view! Why be near the water and not see it right. 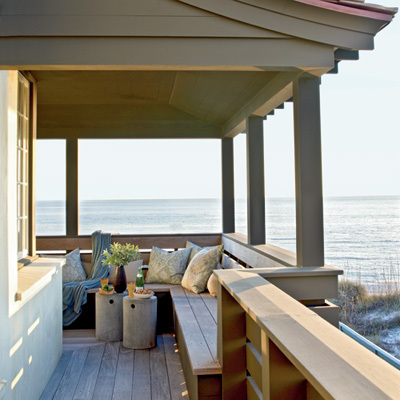 Nothing better than looking from your porch out onto the ocean or lake...so peaceful! 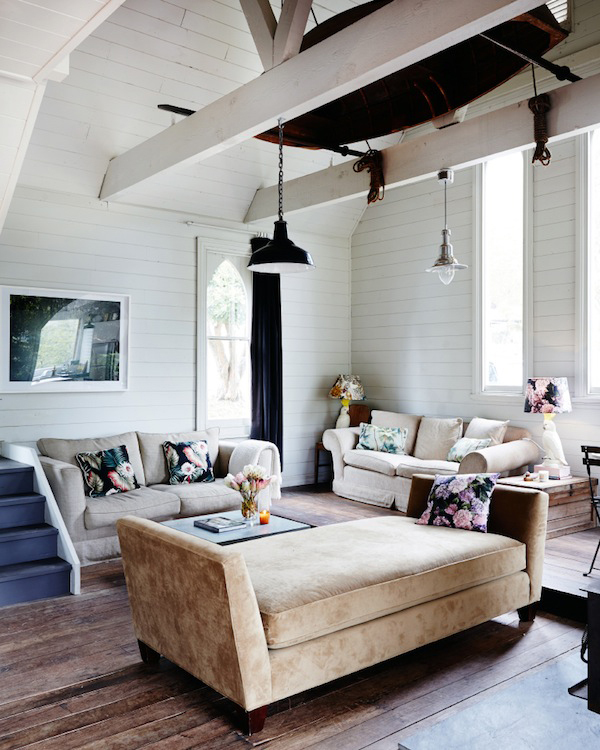 Second you need a great place to crash...cozy seating and lots of cushions for me. 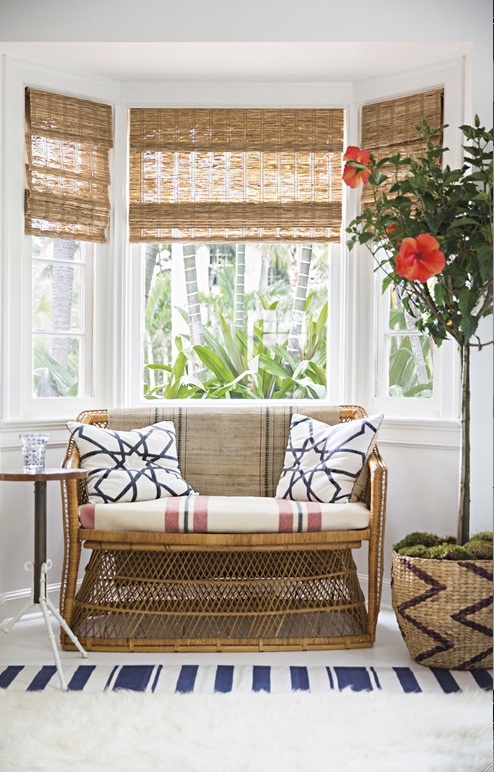 I love the idea of having a big cushy couch and maybe a porch swing or a rocker as well..so relaxing. Third has to be a good spot for dining. 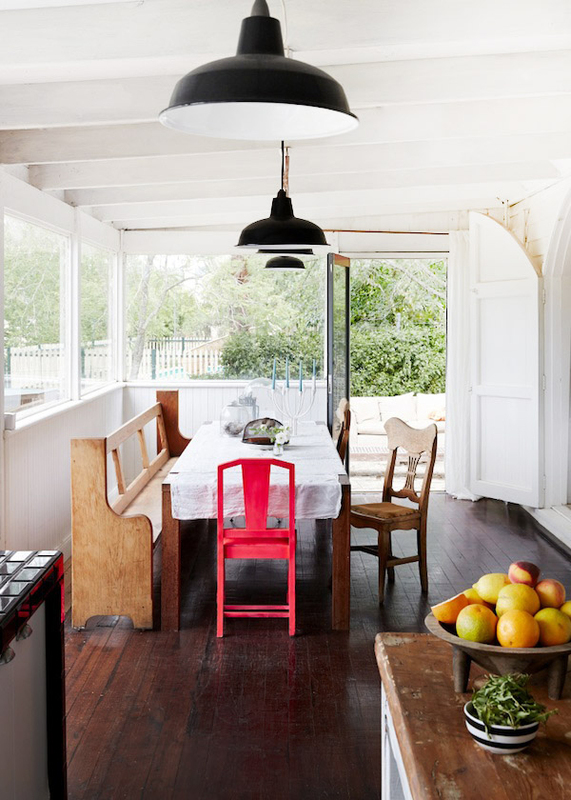 Someplace that you can add nice lighting and enough room for friends and family to sit with you. Four would be a good spot to sunbathe...just to lie out on a long chair and catch a few rays. 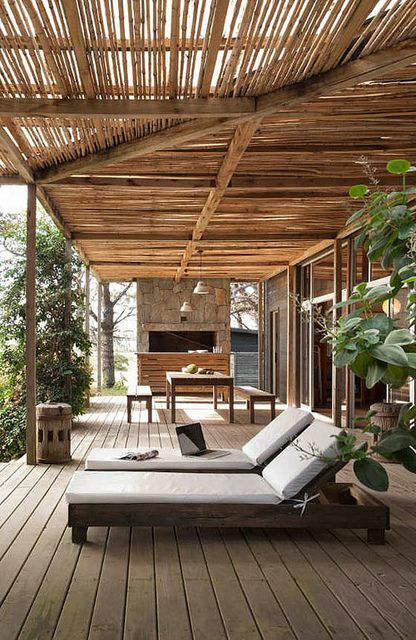 Lastly I would want part of the porch to be covered. A nice spot to get out of the sun but still take in that amazing view. 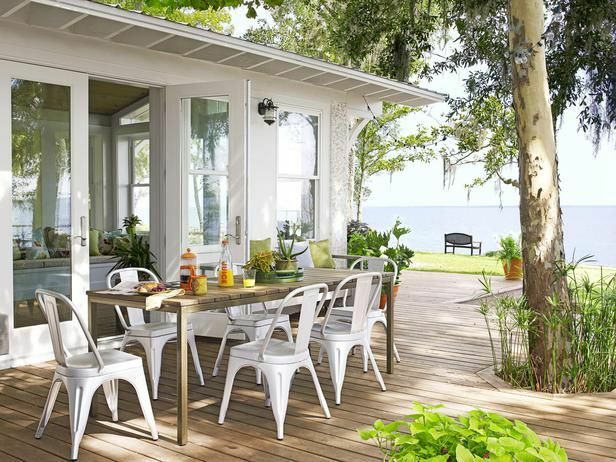 What would you need your dream beach house porch to have? 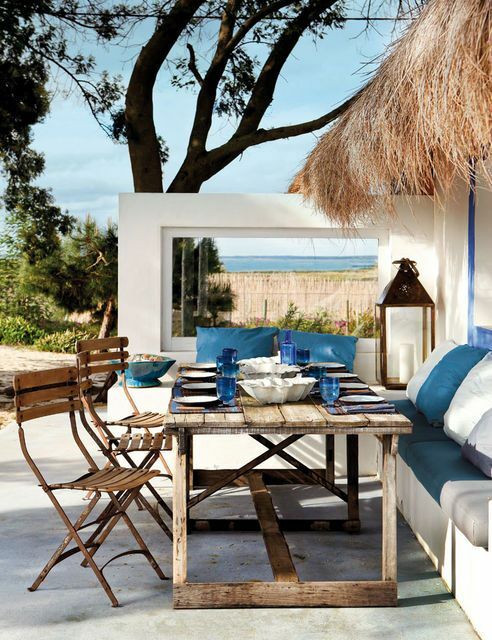 Such a cute beach house from Domino Magazine! 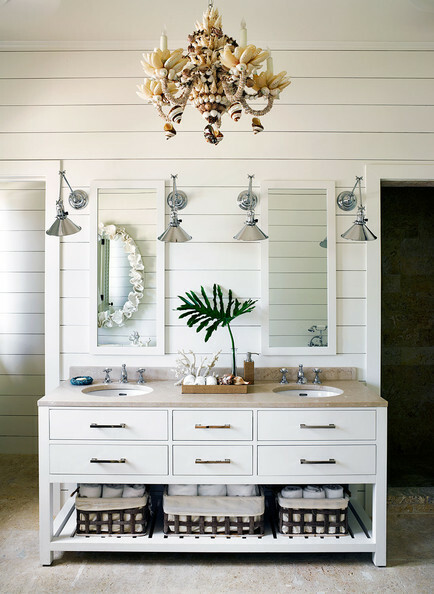 Designed by Anna Burke, it has just the right amount of vintage, rustic charm mixed with a cool Palm Beach vibe. 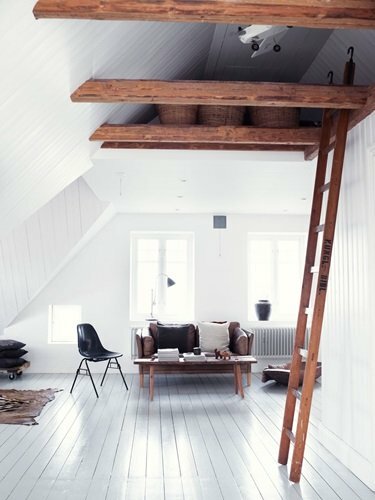 Of course the all white palette with accents of blue and white is one of my all time favourites, so this strikes a perfect note in my books. 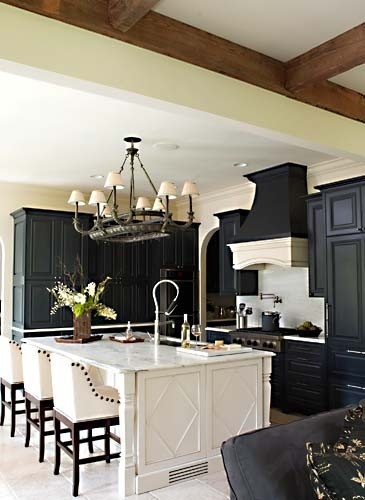 Love the high ceilings in the home and especially in the kitchen area....with these amazing lamps over open shelves it does not get any better! Domino does it again for me! Always one of my go to magazines for inspiration! 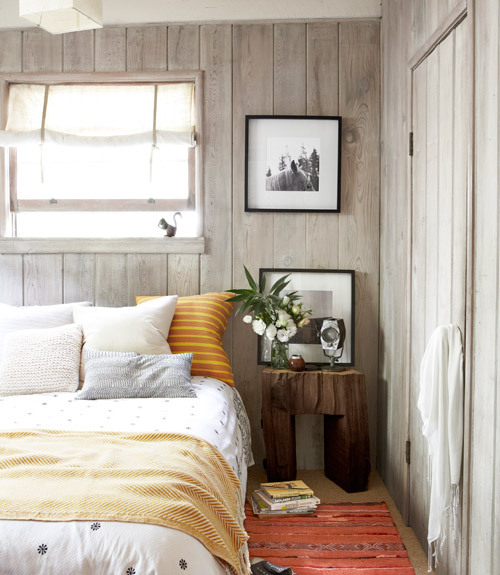 This little California cabin is all vintage and a cute little hideaway for two. 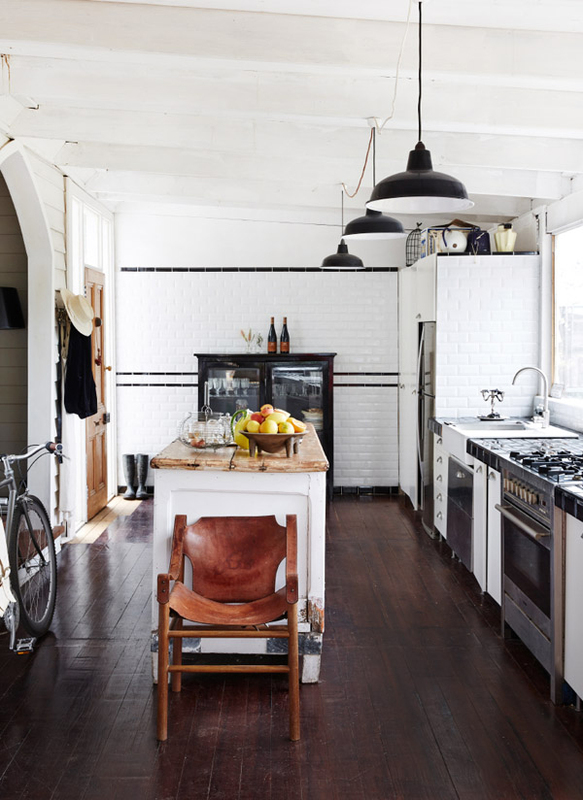 This couple had to be creative in their redo of the house as it is only a rental. 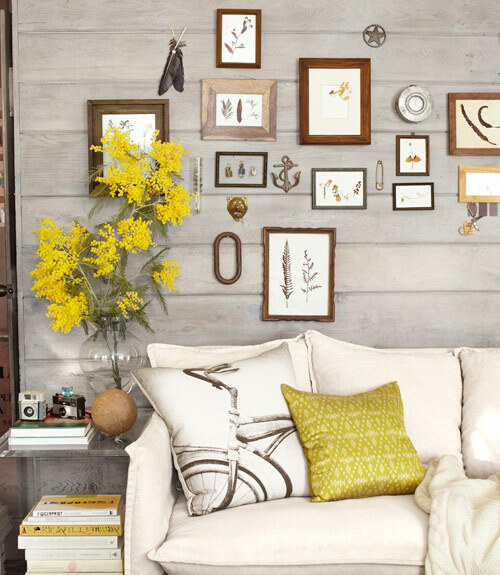 Nice neutral tones with touches of yellow give a good accent for the wood panel walls. 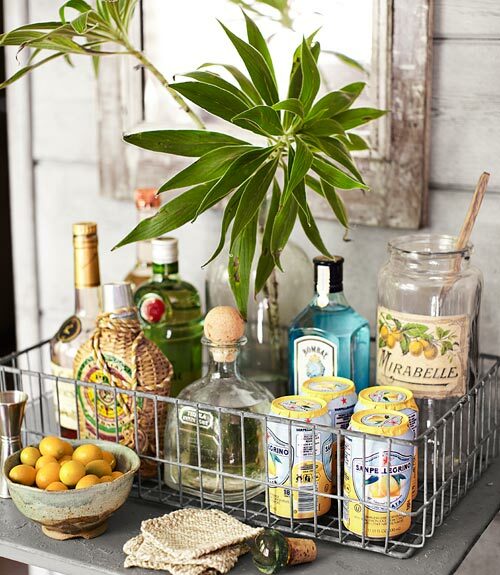 A cute little wire basket is perfect for the bar and a minimalist kitchen is brightened up with colourful accessories. 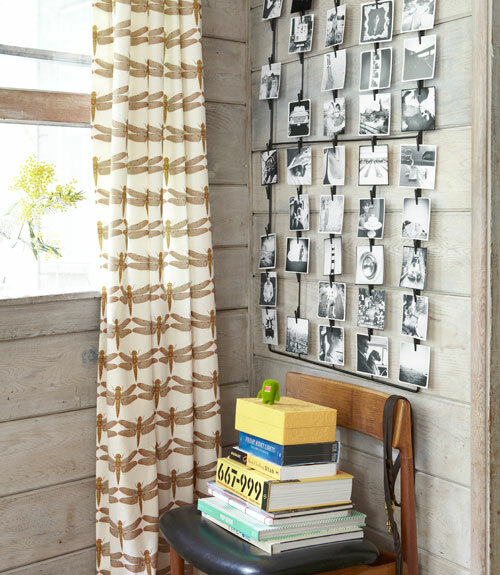 Feels like the perfect rustic cabin decor to me! 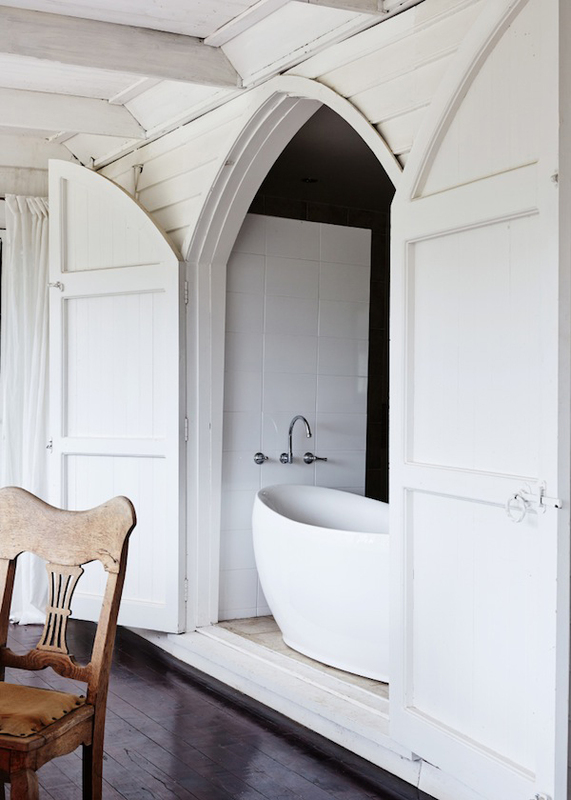 This fabulous home is really a renovated church built in 1880. 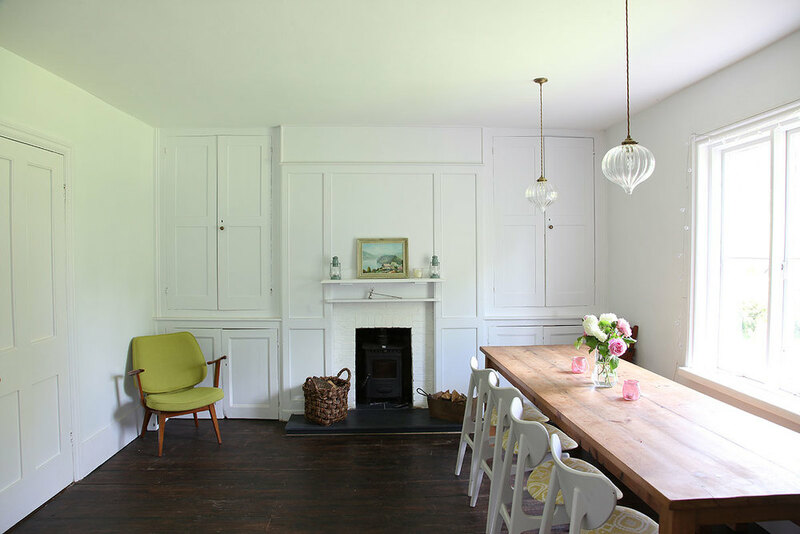 So well done with an amazing dining room in the porch and a gorgeous bath in the closet....so fun. 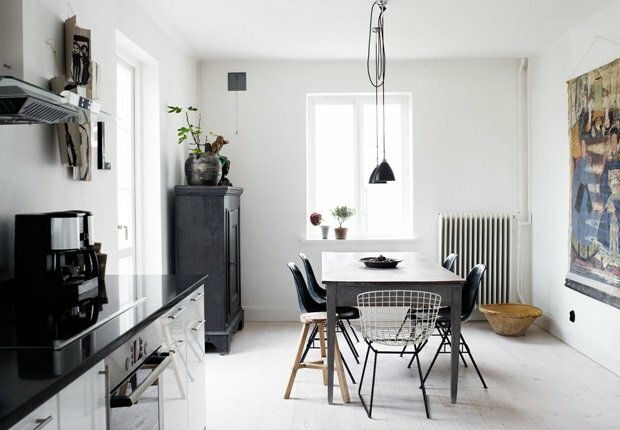 Industrial lamps in black in the kitchen and dining area follow into the living room which is all done in warm neutral fabrics. Yesterday's post was all about adding a pop of colour and here it is again in the dining room with this bright neon pink chair! Doesn't it look great! !